A project to help vulnerable individuals reduce their energy consumption, was awarded £1,222 from the William Milburn Trust. 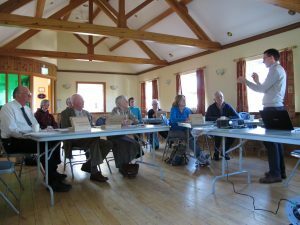 Cumbria Action for Sustainability (CAfS) trained ten ‘Energy Champions’ to provide face to face advice and guidance to help reduce bills and save energy in the Brampton area. Many homes in the locality are old and situated at altitude, so are more exposed to the elements than the average British home. The best energy tariffs are usually found online so without intervention, older and vulnerable individuals who do not have access to the internet are often disadvantaged when it comes to reducing home energy costs. The volunteer ‘Energy Champions’ provided advice on energy saving schemes and tariff switching and supported individuals to access grants that help with household energy bills. An energy monitor loan scheme was also offered to help clients measure their overall electricity consumption in the home and demonstrate how consumption reduces as appliances are switched off. Regular drop-in events were held at Brampton Community Centre, local farmers’ markets and other community engagement events, over a four month period.